OVIS - the SaaS from Inforcom Technologies, India has passed another new height with eligibility testing of 3.5 Million Human Volunteers ! 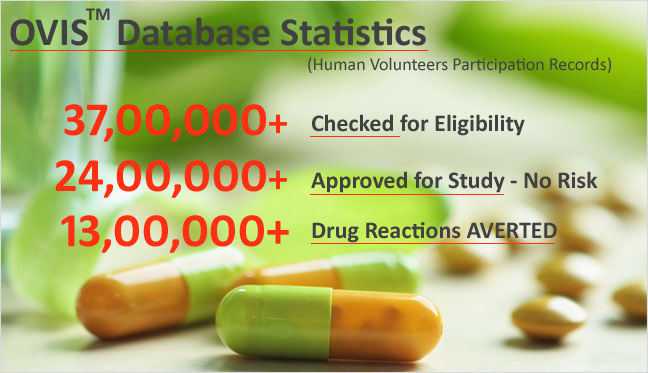 OVIS has become the national platform for Volunteers Cross Participation Tracking in India - once a critical risk to the CRO industry and the Human Volunteers' Health. OVIS has indicated 1.3 Million Human Volunteers as not safe for clinical studies and avoided the Risk to their health. Further OVIS has cleared over 2.5 Million Volunteers as safe for study, based on the cross participation criteria. This offers good quality volunteers to CROs for a risk free trials. Further the test results are more accurate. This can be the guarantee to the Drug Sponsors / Pharma Companies for the usage of clean volunteers.